The game of football is a simple yet dynamic sport on the surface, which at first glance looks just about entertaining. But to anyone who has taken their time to indulge into the beautiful sport, it is much more complex and counterintuitive. Orchestrating a perfect win takes a tactically sound and analytically spontaneous brain, and the pillar of such crucial aspects of the game lie with the manager. And on the topic of managerial brilliance, there would hardly be a discussion without the mention of Arsene Wenger and Pep Guardiola. The two are arguably the most decorated masterminds in English football as of now, if all bias or personal opinions on either of them is disregarded. However, a number of things separate the two gaffers, especially in terms of recent success. And many jump to conclusions of Guardiola being the best manager in the world, which almost makes sense initially, but not when a proper thought is given to it. So, we have taken the task upon ourselves to see if what the masses say is an actuality, or if Wenger is the most underrated, or at least the most under-appreciated manager in Europe. The Spaniard’s followers often try to debunk this common claim, but most are in vain. Pep has managed three major clubs in his career, all three of them are undoubtedly great teams. At his first two clubs, elite players such as Lionel Messi, Xavi Hernandez, Andres Iniesta, Thomas Muller, Toni Kroos, Franck Ribery, and many more were at his disposal. It was no surprise that the Catalan boss managed to outclass almost all teams he faced during his spells at either clubs and dominated their respective leagues. Frank Rijkaard and Jupp Heynckes hardly did anything wrong before their departure. Though it is true that the former Barca boss has won more silverware than his friendly rival, not doing so with the elite group of men that were at his disposal would be nothing less than shambolic. Moreover, it hardly came through as a surprise when the Sky Blues’ tactician struggled and went trophyless for the first time in his career at City. On the other hand, when Wenger landed in London and was received with newspaper titles such as “Arsene Who?”, Arsenal were somewhat inconsistent. Despite having some quality players and a possession brand of football much appreciated by the supporters, it wasn’t until the take-over of the ‘Professor’ that the Gunners became almost on terms with the likes of Manchester United and Liverpool. The Frenchman’s smart dealings in the transfer market and promotion of youth were what made his reign so spectacular initially. Sooner or later, this topic was probably expected, and that on its own says a lot. And to explore this argument, Guardiola’s meagre two seasons are more than enough to compare it to Wenger’s 22-year reign at the Emirates helm. Since taking over at the Etihad, the Spanish tactician averages an astronomical £213 million a season on incoming transfers. And considering it took him a grand total of £252 million to sort out his side’s defence alone, this is hardly justifiable. Whereas the French gaffer averages only a very meagre £32 million per season on incoming transfers. And with that, the Professor has managed to win 3 Premier League titles and 7 FA Cups, which makes Guardiola’s spending sprees almost reckless and panic-motivated. Further, the Londoners’ period of decline after moving to the Emirates was saved only due to their manager’s consistency. And the fact that the longest serving Premier League manager bagged the FA Cup last season by beating the Mancunian giants and the League winners Chelsea shows how tactical brilliance trumps purchase of quality. Though spending also shows a club’s ambition for a secure future, this method of strengthening the squad immensely stagnates youth development, which the Arsenal boss is quite good at promoting. However, the Citizens have a very realistic first dibs on the League title this season, and are contesting for the Carabao Cup on Sunday. This part should somewhat be self-explanatory. 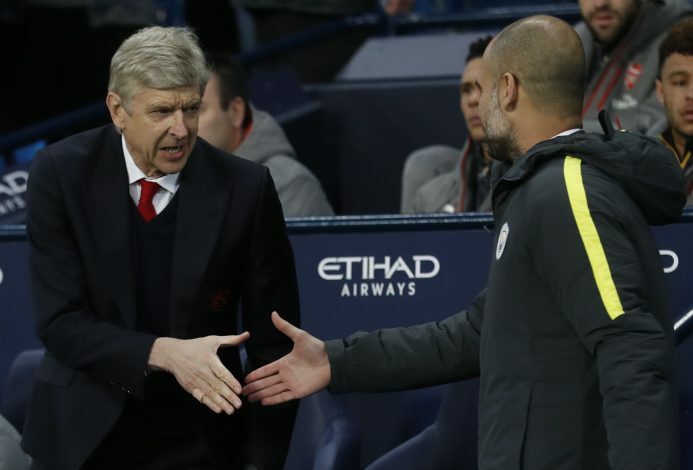 When City went on a record-breaking win streak, they were already being dubbed as the new Invincibles. But as many would’ve expected and the Gooners would’ve hoped, that failed to become a reality, as Liverpool managed to register a win over them back in January. But in Wenger’s case, he claimed his side were capable of doing it, and they showed it on the pitch. And what made that campaign much more special was the fact that it was an era that consisted of a peak Manchester United, one of the best Chelsea sides, and a strong Liverpool team, alongside a Newcastle United squad led by Alan Shearer himself. Even if Pep had somehow done it, it would’ve almost seemed lacklustre considering the state of the current English sides. A mediocre United, to use the words of Roy Keane, an inconsistent Liverpool and Chelsea, and Arsenal, who seem to enjoy embarrassing their fans at this point. It is very hard to measure this trait on the ex-Bayern manager, as he has never spent a prolonged period of time at a single club. But as long as he stays away from such a commitment, his longevity will almost always be questioned. Whereas the Gunners boss has kept mediocrity at bay as much as possible and maintained consistency, and no one put it better than himself: “My most successful years are 2007-2013. Keeping stability while fighting billionaires”. Furthermore, dominating local rivals for over two decades has also been a great treat for the fans. Moreover, despite the rough and embarrassing periods of the club, the former Monaco manager easily managed to maintain that consistency for over 20 years, which is remarkable considering the questionable quality of many players that had donned the cannon on their chest a few years ago. Something the French tactician has always been accused of is constantly selling his side’s best players, and letting superstars force transfers almost often. Robin van Persie, Cesc Fabregas, and Alexis Sanchez are all examples that resulted out of such situations. However, none of them have went on record to say anything negative about Wenger, but instead, they have addressed him as someone they respected a lot. It is easy to see that Wenger is someone who does not force or impose roles or restrictions purely due to personal reasons, unlike someone in particular. Samuel Eto’o, Zlatan Ibrahimovic, Bonfim Dante, Yaya Toure and Hleb are some big names who have openly and harshly criticised Guardiola. Almost all of them have accused him of lacking respectable and comprehensive communication skills, and some have even said they were held back due to the Spaniard’s personal prejudices. No matter how many trophies one leads a club to lift or how many high-profile players one brings to a club, a manager has essentially failed at his core duties if his best players are left dissatisfied.